A battle is brewing over a proposal for the old Marlborough House at 5775 Collins Avenue. The developer’s attorney says it will be “a much-welcomed enhancement to the neighborhood.” The neighbors say it’s a monstrosity that will block view corridors and cast a shadow over Collins Avenue. Plans submitted to the Design Review Board show a new 18-story residential building (above) to replace the existing 12-story Marlborough House. While the new building’s design is within the allowable height and minimum setback requirements for the RM-3 district in which it sits (residential, multi-family high intensity), both City planning staff and residents have raised concerns about the “condo canyon effect” and the loss of view corridors provided by the current building. Neighbors of the project have mobilized over the summer, starting a Facebook group called “Save Collins” which has garnered nearly 700 followers and emailing the Design Review Board, City Commissioners, and candidates for elective office in an attempt to make their case for a revised building design. Next week, they will host a Meet and Greet for area residents to learn more about Mid-Beach issues, though it is expected the 5775 Collins project will dominate the discussion. The group says most Commissioners and candidates have indicated they will attend. It’s all leading up to the September 5th meeting of the Design Review Board when the project will be considered. 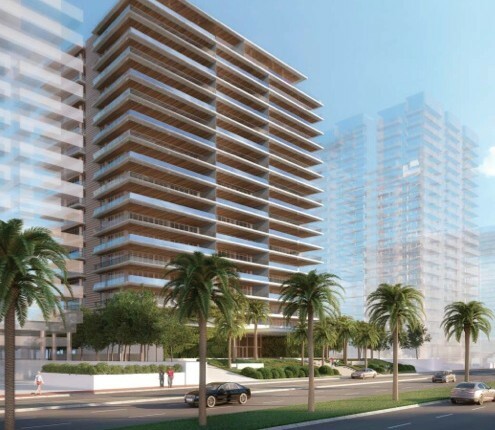 Tensions were first evident at the DRB’s June 7th meeting in which the owner, Miami Beach Associates LLC, asked for a continuance of one month to the July meeting so they could discuss the project further with neighboring property owners. The Board, however, voted to delay it until September given the concerns voiced in numerous emails and by residents in the audience who said it would take longer to resolve the issues involved. The disagreement is not over what is allowed to be built on the site but over the building’s orientation. It is proposed to run parallel to Collins Avenue versus the existing Marlborough House which is oriented perpendicular to Collins with what City staff calls “generous side setbacks” (nearly 79’ on the south side and 73’ on the north end of the property). The result of the current proposal, they say, is “effectively cutting off Collins Avenue and blocking vistas to and breezes from the Atlantic Ocean." The proposed building, they write, "will effectively broadside the Ocean, reinforcing the ‘Condo Canyon’ effect notably seen along portions of Collins Avenue by building the tower from side setback line to side setback line.” The proposal, they note, “will diminish both side yards that serve as important view corridors by over half." “Staff recognizes the applicant’s desire to provide the best water views for the residences; however in re-orienting the building, most, if not all units will still have full views to the Atlantic Ocean and beach," they say. The second battle is over beach access. Staff indicates in its memo “a potential inconsistency with an important policy of the City’s Comprehensive Plan, regarding direct public access to the shoreline” and “strongly recommend[s] that the applicant seriously consider incorporating in its development a dedicated pedestrian beach path.” They cite The Bath Club at 5937 Collins and Mei at 5875 Collins which both constructed beach access within their properties. “The design doesn’t fit with anything we have in the area,” she said. “It looks like a shopping mall. It’s so humongous. One of the things I liked about this area was at least the buildings were reasonable.” She supports the staff suggestion to reorient the building. “If they turned it, that would be ideal, if they reduced the air and light corridors a little less … they’re almost covering the whole area,” she said. Ryan Barras is another Royal Embassy resident who purchased his unit four years ago. He says he’s not opposed to new development. “That’s how a neighborhood progresses and stays lively and fresh but the center point we need to ask ourselves is what type of community we want to be, what type of city do we want to be?” He believes there are ways to ensure a balance between profit and what’s good for the neighborhood. He suggested the building be taller with greater setbacks but is supportive of the staff suggestion to reorient the building. He said he is encouraged by the lively conversation that has sprung up around the issue and is looking forward to next week’s Meet and Greet which he says will give people the opportunity to voice their concerns about the project and be sure it's on the radar of Commissioners and candidates.